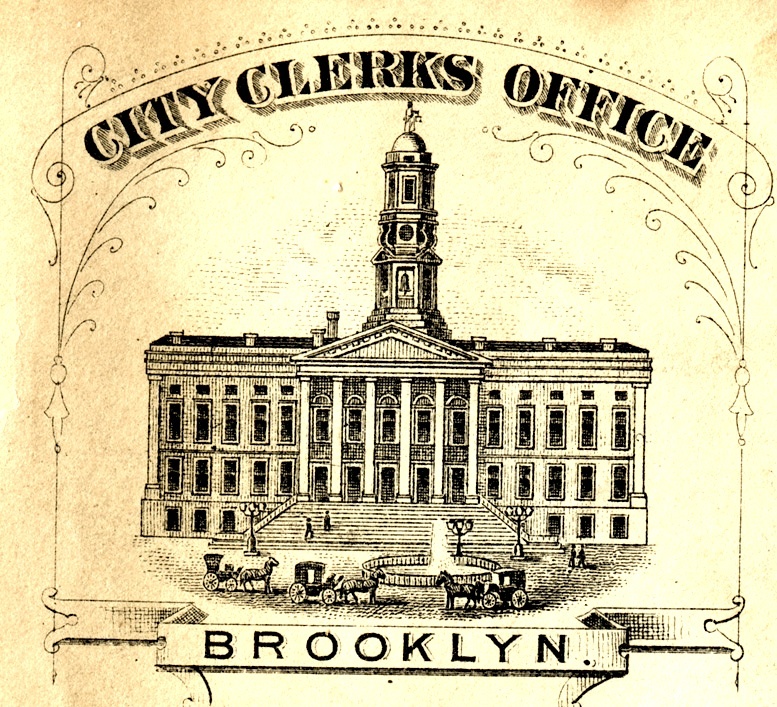 Brooklyn's City Hall, as it was shown on the envelope of the City Clerk's Office, circa 1870. This is really quite an image–and one I have never seen before. Interestingly enough, Gamaliel King (1795-1875), who designed this building–Brooklyn’s City Hall–is interred at Green-Wood. A contemporary described King as a man with “a good deal of cleverness, great industry, and a touch of genius.” He started off in Brooklyn as a grocer, then learned carpentry, became a builder, then an architect. In 1835, soon after the City of Brooklyn was established, it launched a design competition for its new City Hall. King submitted an entry; it finished second. But, with just the foundation having been built, the Panic of 1837 struck, and building stopped. In 1845, a new competition was announced. King’s entry was remarkably similar to the winning plans submitted by a rival 10 years earlier. Ultimately King’s purloined submission was chosen, and Brooklyn’s City Hall was built between 1846 and 1848. 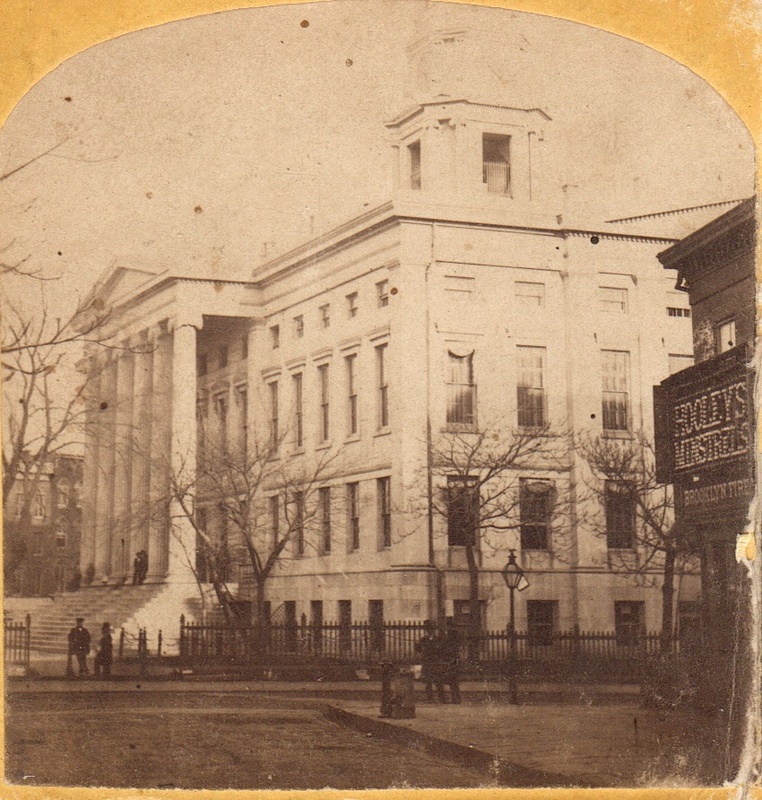 King's Brooklyn City Hall, circa 1865, in a half-stereoview looking east on Remsen Street. Note the sign for the minstrel show (performances by white performers of “blackness” in exaggerated costumes and blackface make-up, supposedly for comedic effect, but relying on racist derision and stereotyping at its core, from the mid-19th century well into the 20th century) on the corner at right. 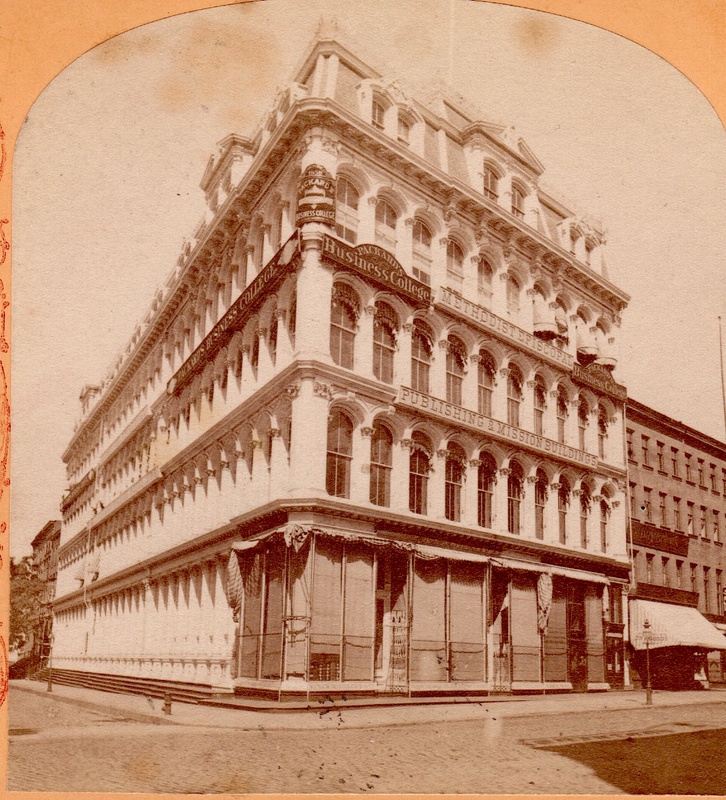 And the same building, circa 1875, in a half-stereoview, looking south. It survives today, in remarkably good shape, as Brooklyn’s Borough Hall. After Brooklyn’s City Hall was completed, King continued in the practice of architecture with John Kellum (1809-1871, and also a Green-Wood permanent resident), who also became one of New York’s leading 19th century architects. Kellum was King’s foreman on the Brooklyn City Hall construction, and his junior partner. They partnered through the 1850s on a number of buildings; the best of them is the Cary Buidling (1857), a landmark that still stands on Manhattan’s Chambers Street. 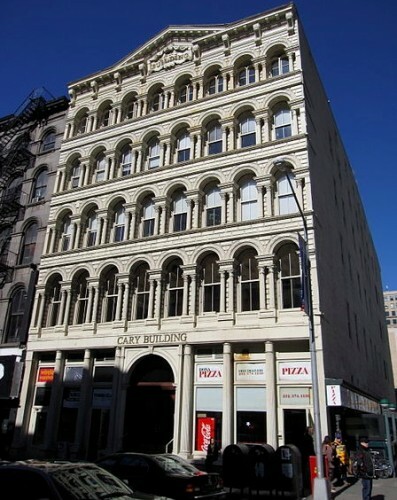 The great Cary Building, by King and Kullum, on Chambers Street. This is one of the best cast iron facades in the world. 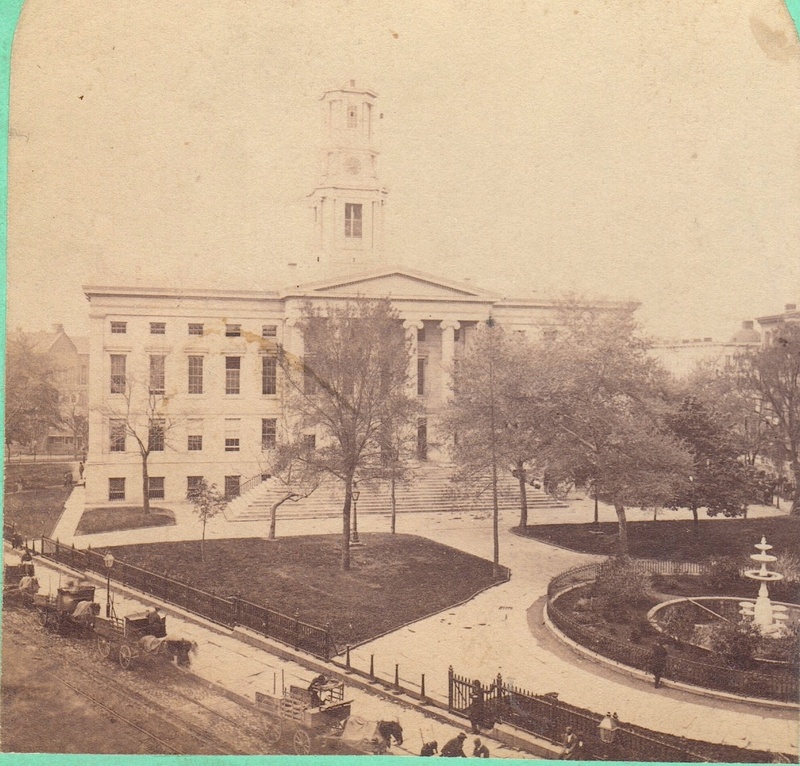 Gamaliel King also designed the Kings County Courthouse (constructed 1861-1865). 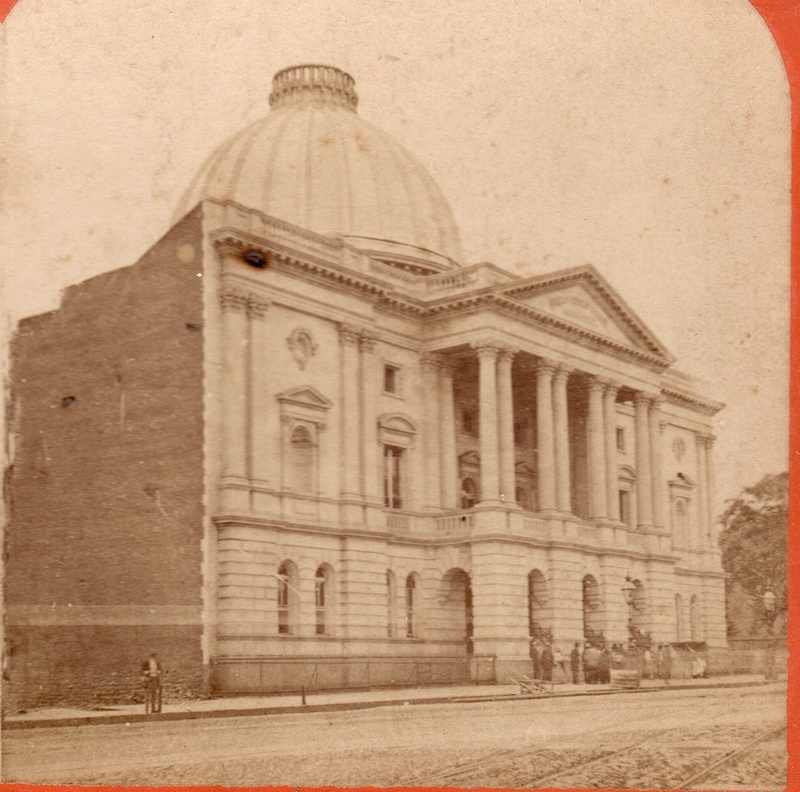 Gamaliel King's Kings County Courthouse, built during the Civil War and destroyed in the 1960s. It stood on the corner of Joralemon Street and Boerum Place until it was torn down by Brooklyn Law School and replaced by its building which now stands there. 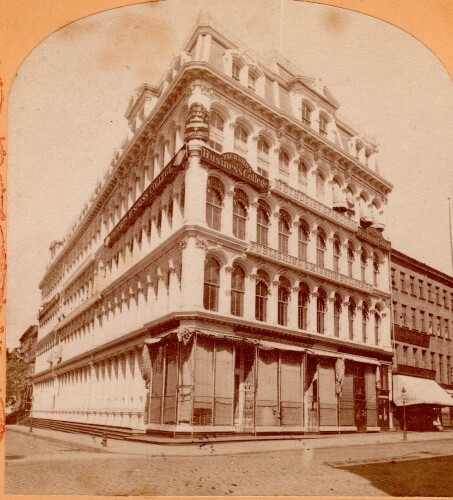 And John Kellum, leaving King in 1859 to start an architectural firm with his son, designed some great New York City buildings, including A.T. Stewart’s Department Store. John Kellum designed this spectacular department store for A.T. Stewart on Broadway and 9th Street in Manhattan. 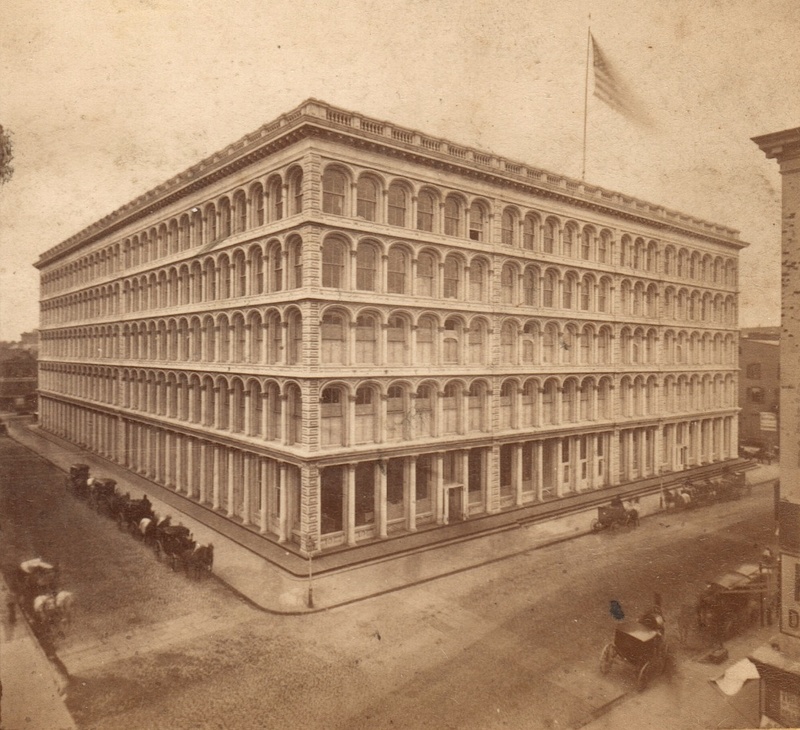 The cast iron facade ran for 328 feet along 9th Street. Floor space totalled 8 acres. It was built from 1859 to 1862, and burnt down in 1956. For a short but very interesting clip of the 1956 fire that destroyed this building, click here. 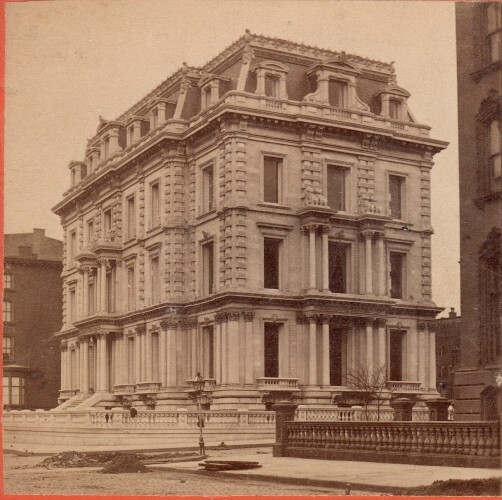 Kellum also designed Stewart's stone mansion, which stood for many years on the northwest corner of Fifth Avenue and 34th Street in Manhattan. Stewart was one of America's richest men. Another spectacular 19th century building designed by John Kellum--this was the Methodist Episcopal Publishing and Mission Building on Broadway opposite Grace Church. It still stands. Kellum also worked on the Tweed Courthouse. At the time of his death, he was designing Garden City, Long Island, one of America’s first planned suburbs, once again in the employ of A.T. Stewart. A.T. Stewart, Brooklyn Borough Hall, Brooklyn City Hall, Cary Building, Gamaliel King, John Kellum.